It’s time for me to share my meanderings on the Internet Superhighway and my favorite feline news stories. I am not in Milwaukee in this photo but I do enjoy the bouquet of a nice red. But I digress. I liked this new take on cat cafe’s. The owner of the cafe, Katy McHugh, says that she met a wonderful yellow tabby at an Amsterdam cat cafe. She enjoyed a good conversation with her human friend and the purring feline in her lap, so much that she didn’t want to leave. That’s how The Sip & Purr was created. Now before anyone who does not imbibe gets their whiskers in a twist, the Sip & Purr will also serve coffee and snacks, so there’s something for every human. And best of all, the felines at the cafe will all be available for adoption. 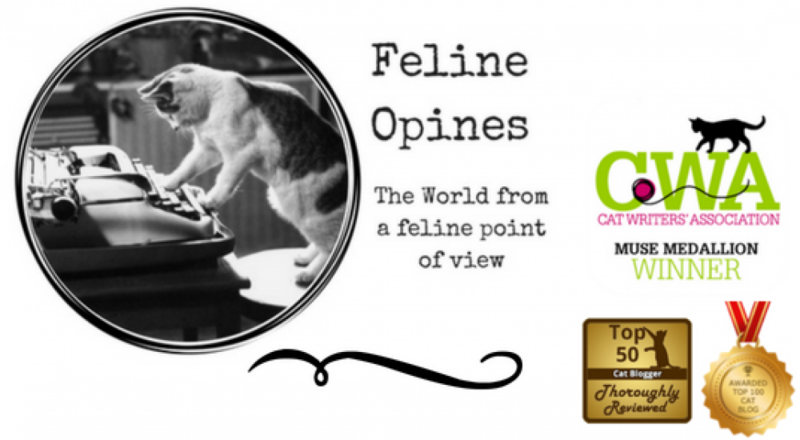 I hope all my Milwaukee friends will head on over to the Sip & Purr after it opens on June 1st and, if you do, please opine about your experience in the comment section. The Tribe of Five belongs to a lot of cat groups and every day we see feline birthday notifications, many of them photos of the kitty party. If you are inclined to throw your cat a birthday bash, these tips are for you. The Female Human couldn’t pick a favorite, she loved the kitty cookies, the mini cat pinata and the crystal cat ears headband. You humans will have to decide for yourselves. Looks can be deceiving. This kitty named Luhu may look sad but he’s a happy kitty. He lives in Beijing, China with his human, Maggie Liu. He may look like he’s frowning but he’s a happy guy, loves to play and is full of purrs. Luhu was born with developmental defects which account for his sad appearance. His original human didn’t have the time to give him the care he needed so Maggie Liu adopted him. Luhu shares his home with two other felines. His unusual expression has made him an Instagram sensation, so if you want to see more of Luhu, just go to his Instagram account. The 2018 pet name winners are an orange and white cat named Pablo Purrcasso and a white pitbull named Isabella Miss Worldwide Boo Boo. The article got me thinking, you humans come up with some strange name combinations. Take my name for instance, because I’m a lean, mean moving machine and The Male Human is quite the cycling aficionado , I ended up with the name Alberto Contador. So as you purruse the names on this year’s list like Sir Reginald Fluffybutt or Princess Consuela Bananahammock,just remember there’s a story behind every feline’s name. Sometimes we felines don’t get enough credit for the good things we do and sometimes, doing good things is just letting humans hold us. Case in point, check out the story of the students from Metropolitan State University who had the opportunity to spend some stress-reducing kitten time. The nice humans from The Feline Fix and Metro Denver C.A.T. teamed up to bring seven-week-old kittens to the school’s Biology Department to provide some relief during a notoriously stressful time. And, the kittens will all be eligible for adoption when they’re 12 weeks old. Good thinking humans, two paws up! This entry was posted in adopting kittens, animal shelters, athlete cats, Cat adoptions, cat behavior, Cat blogs, cat cafes, Cat writers, cats, kittens, Pet blogging, shelter cats, Siamese cats, Top 50 Cat Bloggers, Walk Through the Web Wednesdays and tagged Alberto Contador, cat birthday party, kitten cuddles for stress releif, Luhu the sad looking cat, Milwaukee cat cafe, Purr & Sip, students cuddle kittens by Feline Opines. Bookmark the permalink. Luhu is going to give Grumpy cat some competition. Those were all goodies but Luhu is a real sweetie I’ll bet. thanx for sharin de inter webz walk a bout..
We’re all about the nip at our house. The humans put down some newspaper on the rug, sprinkle it with the stuff and it’s an evening of entertainment! What a great place to find your next feline. Love it. Best to all of you as well from both our Humans! Kitties fix everything … from finals to sadness … and kittens even more so! Hugs and Purrs to you guys too! You have been visited by Lilly Bug of 2 Cats and a Blog. Why hello there Lily Bug. My name is Lily but the Humans call me Lily Bug because I’m a love bug. How did you get your name?